If you like rich, earthy flavors, these are the chips for you. The flavor is so bold and nutty, when I ate these with some moderately spicy salsa, the taste of the chips almost completely overshadowed the taste of the dip. Not sure if you folks ever shop at Trader Joe's, but these Archer Farms chips were reminiscent of the Flax Seed Chips from TJ's. And Archer Farms' chips are organic. Not bad for a national-chain department store brand. At $2.99, a bag of truly organic chips is a steal. It's a good size, too. Working on a healthier diet? I know I am. And replacing the Doritos with something like this could be a good start. There's still plenty of snackability, but with less fat and much better ingredients. The problem, however, is that the taste is so potent, that you either need to eat these chips plain, or you need some ultra heavy-duty dip. I don't mind them plain, but I often crave something sweet or cheesy. In that sense, if you're not in a nutty mood, or if you're someone who simply craves the taste of salsa, you'll want a lighter chip so you can actually taste the sauce through the richness of the chips. Or, if you want a tasty chip that doesn't even need salsa, check out Kettle Chips 39787 Backyard Bbq Potato Chips (Google Affiliate Ad). 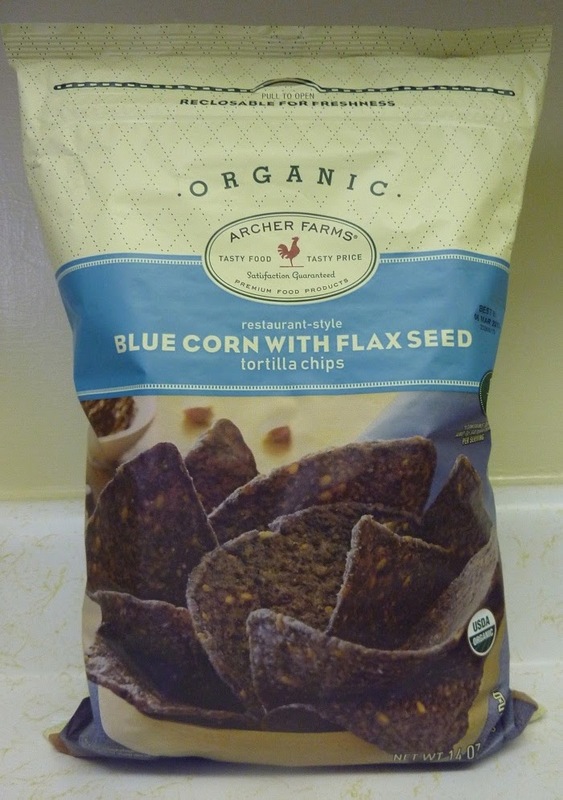 I tried these blue corn chips with Archer Farms Corn, Black Bean, and Roasted Pepper Salsa (review coming soon)—a medium-hot salsa with plenty of flavorful ingredients—but the chips provided most of the flavor. Which could be good, but I really wanted to taste the salsa, too, because it is tasty with less-flavorful chips. Maybe some spicy-cheese dip or guacamole would be more appropriate for such a massive, bold taste. Either way, I'm going with an above-average score on these chips for their good value and relative wholesomeness. Let's give 'em 7 stars out of 10. These chips are our favorite but I only buy them when they go on sale 2/$5. Or if I have a Target coupon. We use them when we make a meal of nachos-- real cheese, black olives, beans, homemade gauc, you get the picture. I'm also a big fan of sales at Target. Your nachos sound tasty! 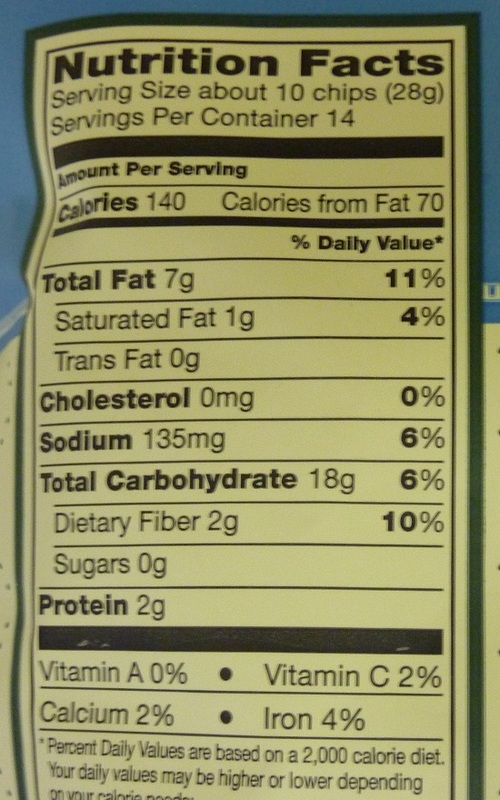 For a product that is touted as a healthy option (Organic, no trans fats, whole grain...) they certainly fail with regards to sodium content. These have the highest sodium levels of any other blue corn chip brand I have seen, 135mg. 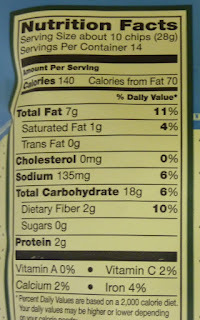 Other brands range from 10-80mg for the same serving size. Way too salty for my taste. That is true, Bob! Thanks for pointing that out! Boo for package size decreases! (Unless the price decreases also). Have your blue corn chips been test for levels of acrylamide? What are the test results?